Typically by Day 2 of SIHH, you’ve gotten your sea legs and are somewhat more prepared for the bloodbath that awaits you past the doors of the Palexpo. However, since I’m me, that’s not exactly how it played out for 2019. Armed with a hurried breakfast and a couple of cups of what Europeans think Americans mean when they ask for coffee, I found myself standing in line yet again to get through security at the Palexpo. While I know that you don’t really care about such things, I do have to make note of the fact that the lines have gotten much longer this year, in spite of the list of attending media partners being reduced considerably from the year before. Maybe they’ve been replaced by retailers? Whatever, it is what it is. After getting shunted by a solicitous usher to a separate line that seemed to promise a shorter wait – it later turned out to be much, much longer – we found ourselves in the Carré des Horlogers, which is SIHH-speak for “the area where you can one-stop shop for all the independent brands exhibiting at the show.” Since we were slightly early for our 9 am appointment with the Belgian independent, Ressence, we took the time to pop into the Laurent Ferrier booth to talk with our friends, brand CEO Vanessa Monestel and her right hand man Vincent Robert (who also doubles as the Director of Traveling Education for The Horological Society of New York). However, since our appointment with them wasn’t until tomorrow, rather than spoil any surprises we instead just exchanged our pleasantries and ordered more “coffee” at the nearest bar. The big news for Ressence this year is the official debut of the Type 2 eCrown, which we were first introduced to in concept form at SIHH 2018. By any measure, this is an ambitious timepiece, attempting to integrate modern technology as seamlessly as possible into a traditional mechanical watch. To this end, a solar-powered microprocessor contained within uses a series of tiny motors and a low-power Bluetooth transmitter which connects the whole shebang to an app on the user’s phone. A double-tap on the impossibly domed crystal wakes the watch, while any single tap that follows cycles it through various modes indicated via a subdial. When connected to your phone, not only will the eCrown ensure the time is set properly, but you can also select which time zones you would like to have saved to the watch. Does it work? Yes, indeed. Gaetan Gaye, Ressence’s International Brand Director and friend of RedBar was only too happy to put the eCrown through its paces, and, yes, it works exactly as advertised. But what if you don’t want to use all that fancy-schmancy technology? That’s absolutely fine, since the Type 2 can operate entirely as a standalone mechanical watch as well. Now, by no means is this being billed as a “smartwatch”, so don’t expect it to send you notifications and monitor your workouts. But as a “best of both worlds” statement piece, it more than succeeds. 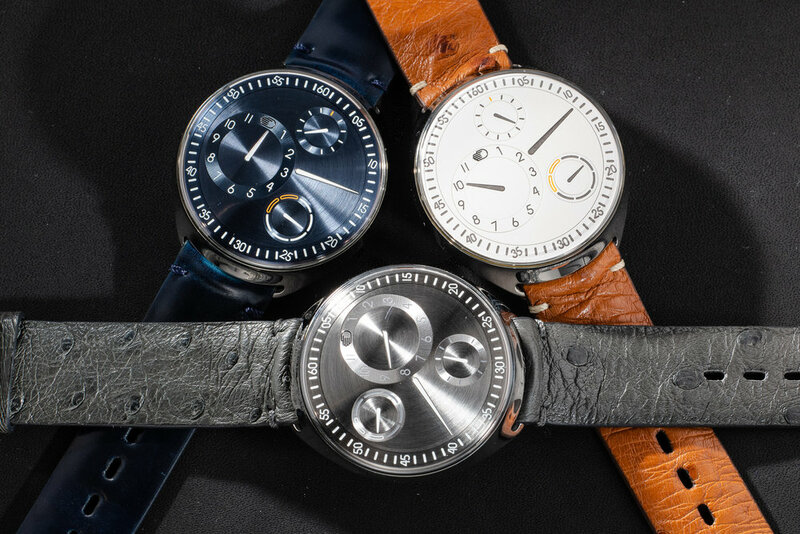 Other highlights include a new white dial version of their diver, the Type 3 and an entirely revamped Type 1, which now has a slimmer and more ergonomic case. Since we had time to kill before our next appointment, Atom decided to mosey on over to Grönefeld to see what Bart and Tim had cookin’. Per usual, the GPHG-winning brothers have been busy in their horological kitchen, with the 1941 Principa Automatic catching our eyes this time around. I was smitten with the turquoise dial, while Kathleen was more into the salmon dial. That said, anything from Gronefeld is the right choice, which naturally includes their trademark 1941 Remontoir. The bespoke pieces with their Voutilainen-manufactured dials remain among the most stunning examples of the craft. As for Bart and Tim, they were their usual ebullient selves, serving as a tonic of sorts for my sleep deprived state. Come to think of it, if every morning included some sort of interaction with either of these preternaturally cheerful and positive human beings, the world would be a much happier place. When you step into the Greubel Forsey booth, it’s a foregone conclusion that you’re going to have your mind blown. It really doesn’t matter what sorts of watches float your boat, because regardless of whether you’re into vintage divers, steel Rolexes, or you’re a die hard G-Shocker, when you get your mitts on a GF nothing else matters. Sure, you might not be 100% down with their unique aesthetic. But there’s absolutely no way of denying that the item gracing your wrist is quite possibly the most beautiful and meticulously finished thing that you’ve ever beheld in your life. For 2019, their big story is the Balancier Contemporain, which is a bit ironic when you consider that it’s the smallest watch they’ve ever created. Clocking in at a hair under 40mm, the Balancier Contemporain manages to embody everything the manufacture is known for. But unlike most of their other pieces, it now fits comfortably under your cuff, if you’d ever bother to cover it up to begin with. The Art Piece Edition Historique on the other hand is pretty much everything you’d expect from a Greubel Forsey turned up to 11. It clocks in at 44mm in diameter with a thickness of 16mm, which helps it accommodate a double 30 degree inclined tourbillon. Our next appointment was with the ridiculously awesome Laura Hoopinger, who, as far as we’re concerned, is the Keeper of the Keys for Richard Mille in North America. Trust us, if you want anyone to walk you through the RM collection, it’s her. Anyway, for their SIHH swan song – yes, this will be RM’s last year participating in SIHH, as if you didn’t already know – they decided to go out on a sweet note. Hence the Bonbon Collection, as conceived by their artistic director, Cécile Guenat. The collection consists of two model lines, Sweets and Fruits, with the former featuring ceramic cases and the lateral combination of their trademarked Carbon TPT and Quartz TPT composite materials. My personal favorites from each line are the RM 07-03 Marshmallow and the RM 16-01 Fraise (Strawberry), but every one of the ten limited editions that comprise the entire collection are delightful in their own way. Now, given that this is Richard Mille that we’re talking about, it goes without saying that in spite of the lighthearted theme, the case, dial, movement finish, and decoration are executed brilliantly. To wit, each of the tiny sculptures adorning the openwork dials of the Fruits line are executed entirely by hand and then painstakingly rendered in acrylics and lacquer. As for the Sweets collection, we’re talking about grand feu enamel, people. RM don’t play. 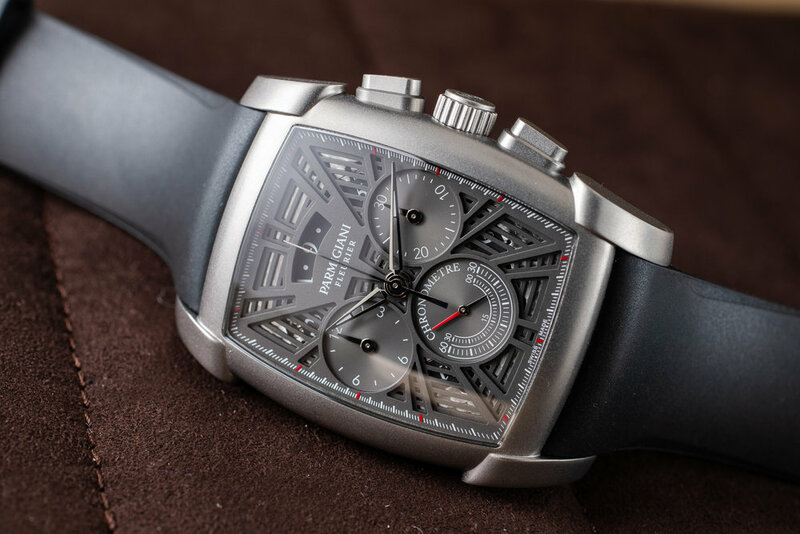 From Richard Mille it was off to the Parmigiani group press conference, where we were treated to several new Toric pieces and one rather imposing Kalpa chronograph. Before I go into the watches, it has to be said that there’s very little better in life than being greeted by Parmigiani’s PR maven, Fernanda Zapata Vakil, principle at Gigantem. Much as with Bart and Tim, she always manages to find a way to put a smile on my face, even when I’m running on two hours of sleep and fighting six hours of jet lag. 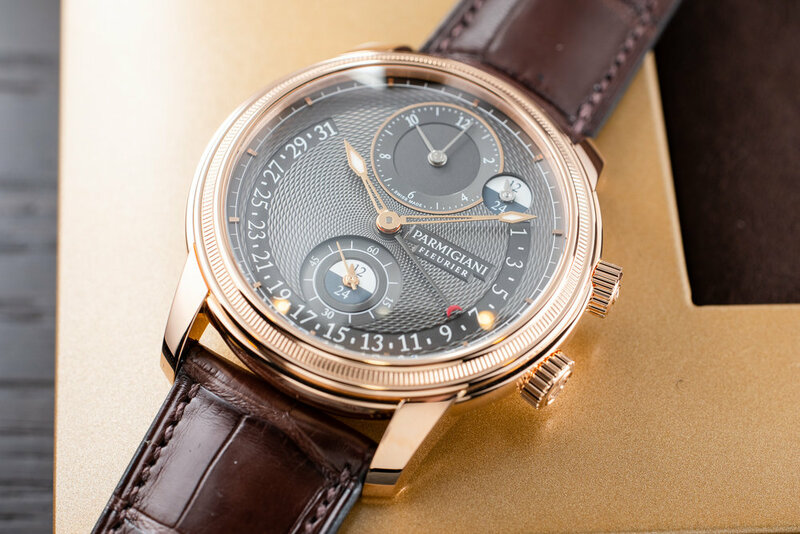 On the Toric side of the equation, the highlight for me was the Retrograde Perpetual Calendar. 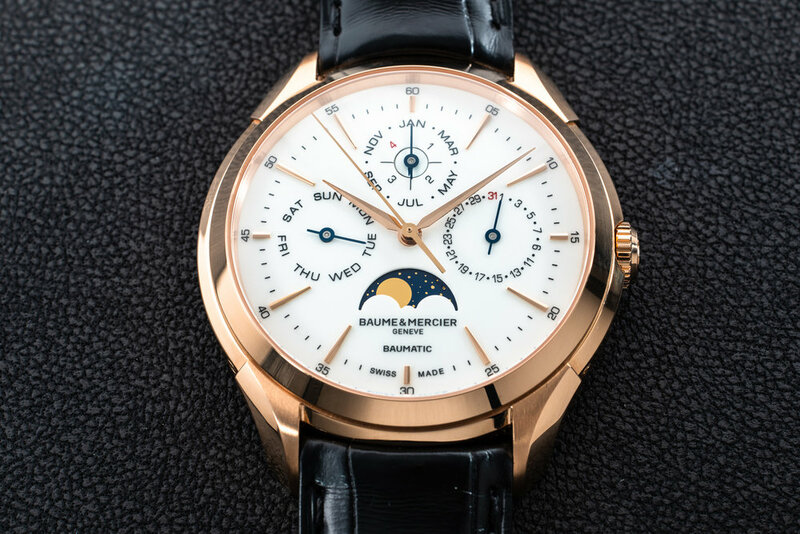 As the name indicates, the date is rendered as a retrograde complication, while the perpetual calendar was engineered in such as way as to ensure an instantaneous date switchover, regardless of whether you’re crossing a day, month, or year. And then there’s the dial which has been guilloche’d to within an inch of its life. This is true haute horlogerie, folks, and yet still entirely accessible in terms of aesthetics and function. The new Kalpa Kalpagraphe Chronometre comes to the party with Parmigiani’s first integrated, vertical clutch column-wheel chronograph movement, which is tonneau-shaped just like the case itself and all the movements in the Kalpa family. What’s more, it runs at 5hrz and has a generous 65hr power reserve. The micro bead-blasted titanium case and open-worked dial are resolutely contemporary, and size is just right, with the whole schmear clocking in at 48mm X 41.8mm x 14mm – in other words, not too big and not too small. A Goldilocks. If there’s one group press conference that you don’t want to miss, it’s Cartier. Not only am I pretty sure they’re taking attendance (they are, it’s Cartier), they’re the big dog in the Richemont kennel, and they know a thing or two about making watches. This year, they introduced several new models in the Santos collection – including the entry-level Santos-Dumont quartz – the Panthere de Cartier collection and more. So much more, in fact, I’m not even going to attempt to recount them all since you’re just gonna go to Hodinkee for the scoop anyway. My favorite? Easy, the new Santos Chronograph with its ingenious 9 o’clock side start/stop pusher, which is balanced out by the reset pusher hidden in the crown. Leave it to Cartier to decide that the standard 3 o’clock-side layout wasn’t worthy of the Santos and come up with their own. As with all Santos-based watches, make mine two-tone. 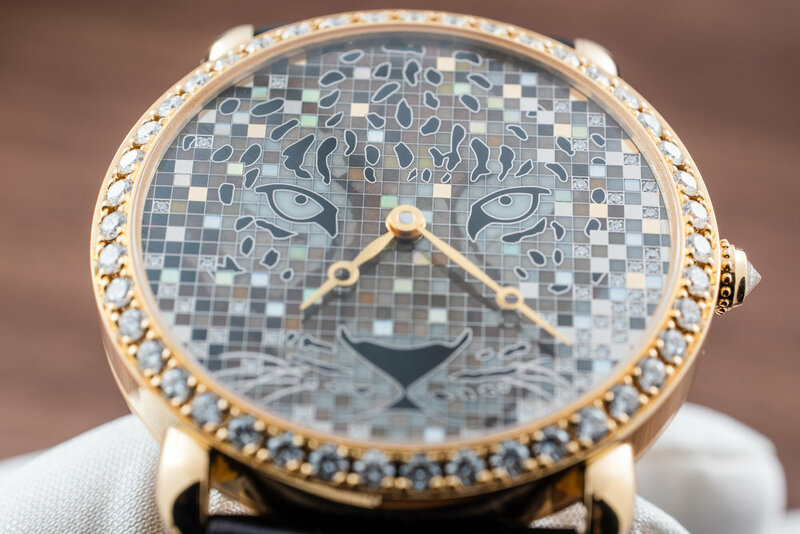 And then there’s the new, all-diamond/all-the-time Revelation d’une Panthere which features a double-layered, fluid-filled crystal that has approximately one billion tiny diamonds that fall at a measured rate and slowly reveal the outline of, well, a panther. The effect is insanely cool and really makes me wish I had the requisite $200K to buy one for my wife so that I could wear it around the house when she’s at work. 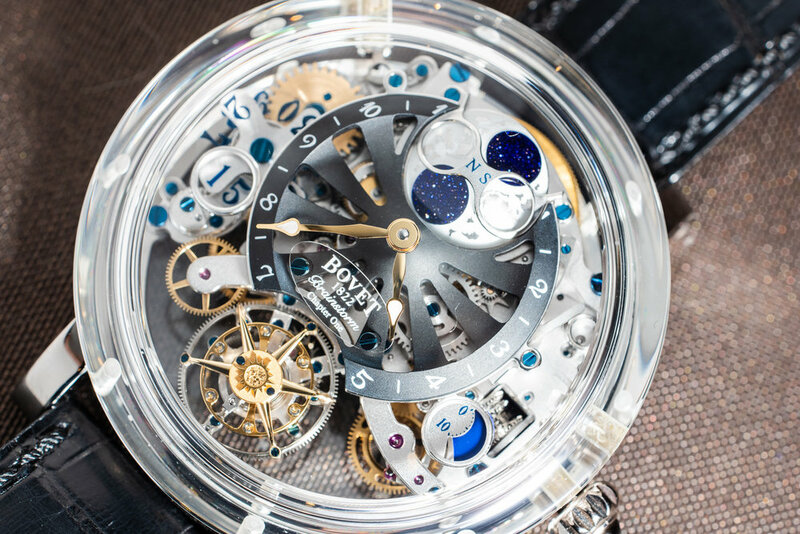 Our next stop was nary a hop, skip and jump away at the Bovet booth. 2019 marks the first year that they’re exhibiting at Palexpo, though not exactly their first time showing in Geneva. In years past, Bovet set up at the Beau Rivage and I always made the trip over to view their baroque novelties. Well, no more. Now it’s true one-stop shopping, and this year the main event was the sapphire crystal cased Recital 26 Brainstorm Chapter One. Under the ingenious “writing slope” case – think “writing desk” but… sloped – lurks an expertly hand finished flying tourbillon with a three-dimensional moon phase, big date complication, and an ample 10-day power reserve. 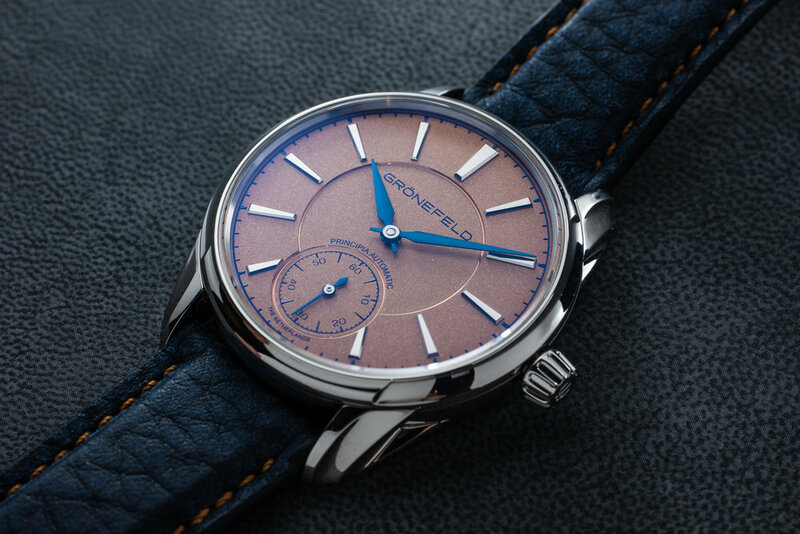 The other big story from Baume et Mercier is the new Baumatic with a gradient blue dial. As with the Vacheron Constantin FIFTYSIX, the change in dial color is nothing less that truly transformative. Whereas the Baumatic was always significant as the first series production watch from Richemont with a silicon escapement, with this new dial it finally has the beauty to back up its brains. There’s a lot of want here. With Baume et Mercier in the bag, it was time to bid adieu to Day Two of SIHH and head back to the hotel to make my dinner appointment with the team from Audemars Piguet. Now if you thought that this dinner would be held in some stuffy, upper rung Genevois eatery with more than one fork in the table setting, you’d be forgiven but wrong. This year, in what was a most welcome turn of events thanks to Paul Lerner, their final SIHH press dinner was held at a local Mexican restaurant El Catrin, and I have to say that it was probably one of the best meals that I’ve ever had in the Canton of Geneva. Sitting to my right – again – was the ever-game Halim from Watch Collecting Lifestyle, who (in case you didn’t know) hails from Mexico, so he knows a thing or two about Mexican cuisine. According to him, the joint nailed it, so who am I to say otherwise? Anyway, after too many margs, tacos and a metric ton of guac (and luchadors – really), it was time to stumble back to my hotel and prepare for Day Three.